Active since 2010, the architecture lab theOtherDada defends an alternative position towards the current practice of sustainability through exploration of the context and medium, invoking new relationships between climate, landscape, and inhabitants. Informed by our research into biomimicry, we aim to connect to the natural ecosystems of sites to understand and consequently devise new potential living habitats. theOtherDada works within a collaborative process between architects, scientists, botanists, artists, economists and the craftsmen. Every environment an architect confronts consists of architecture; the existing. Every site is meticulously organized and inhabited. Facing the complexity of this contemporary issue, our role lies in the thoughts of architectural impact by exploring the capabilities of context in producing new relationships. The team aims to have a holistic understanding of the living systems and communities that they are affecting. The importance of biomes is that they show how organisms are well adapted to local concerns of climate, nutrition, energy, and water. The adaptation strategies could be used as design solutions. theOtherDada’s design process is organic, dynamic and interactive. Informed by our research into BIOMIMICRY, we consider the world differently; like a system of RELATIONSHIPS and EXCHANGES, not like a system of isolated objects and actions. Proposal to introduce Contemporary Public Art and Design works to the public areas of Downtown Beirut. - 'The Visitor' by Belgian artist Arne Quinze, commissioned specifically for the site and that aims to counteract the monumentality and rigidity of the space with its tall, chaotic bright orange structure inspired by tree houses and shanty towns, like an alien spaceship that landed in Beirut Souks' orthogonal space. The Visitor rises 16 metres in height on slender legs that allow for pedestrians to circulate underneath. Oman’s natural and cultural landscapes are famous for their astonishing beauty, from dramatic high peaks and canyons, ancient oasis settlements with their traditional forts and houses, dense monsoon forests, barren gravel wildernesses, sand seas furrowed by high dunes, to coastal cliffs and fjords. To geologists they tell the story of millions of years of Oman’s history because, unlike temperate countries where rock formations are mostly covered by soil and vegetation, the geology of Oman is visible for all to see. The aim for this mater plan is to create different micro-climates, extend the touristic season, and increase the site’s biodiversity. Six characteristic areas, where each present unique climatic and topographical properties, have been identified to help guide the material choices of the different interventions: Oasis, Coastal Area, Canyon, Gravel Wilderness, Food Production and Lush Valley. The important presence of the UNESCO-protected archaeological site of Sumhuram, paired with the rich traditions of the Omani people, make Khor Rori a place of utmost charm and cultural significance. Let's Talk About the Weather: Art and Ecology in a Time of Crisis is an exhibition addressing urgent issues around a changing climate, future ecological disaster, and what this means for our present moment. The exhibition, organized by Guangdong Times Museum & Sursock Museum was designed by tOD, who worked closely with the organizers, along with the artists to create a dynamic exhibition experience. tOD also supervised the installation of the exhibition taking into consideration the environmental footprint. The tower is an edgeless form that bends to assume the most advantageous stance. On the ground level, it stretches towards both roads and expands to allow for maximum retail space, while announcing the main entrance lobby with a concave movement. On the first few floors, the building contorts to orient the majority of its façade away from the neighboring structures. Above the neighbors, it turns to find the most appealing views and orientations. Throughout its vertical progress, the tower recedes further away, steadily losing mass as if dissolving into the other, resulting in an airy silhouette with a thoughtful moderate impact on both neighbor and passer-by at street level. Home Of Innovation is a winner of the 2016 Green Home of the Year Award. "The Home of Innovation Demonstration House is the first single-family home in the Middle East to earn Platinum certification under the U.S. Green Building Council (USGBC)’s LEED for Homes International Pilot program." TRKL Lab is an initiative to help promote and empower Lebanese designers and design, by providing them with the right tools, craftsmanship and community. It consists of both, a workspace to gather people and help them develop ideas into concrete prototypes, as well as a fully integrated professional production facility to enable designers to expertly produce their designs, with the latest technologies and machinery. tOD’s proposal’s focus on simple interventions and in-depth look at the negative impacts of manufacturing on our local environment, led us to being chosen. Our work consists in designing the space as well as researching and implementing sustainable and environmentally-friendly production techniques and materials. The project is an interior design make-over of an apartment in Gemmayzeh, Beirut, with a side garden and a terrace. The design strategy applied aims to transform the space into a Living apartment that embodies characteristics of biophilic design by which the natural features and processes are integrated in the design of the built space. Thus demystifying the notion of sustainability and its application in indoor spaces therefore communicating new systems to the public. To materialize these aspects, several sustainable practices are adopted such as domestic water treatment plant, waste management system, recycling and composting, domestic solar water heater, and chilled-water air conditioning system. All interior materials such as, paint, glass and insulation are certified, red list free and low-VOC emitting materials. The landscaping of the outdoor garden employs native species to attract local biodiversity and urban pollinators and uses drip irrigation to reduce water needs while offering the possibility for organic urban farming. Beirut River Watershed Project is a holistic strategy for Beirut River and its watershed developed by theOtherDada and their partners LCEC and UNHabitat with the ultimate aim to Bring Beirut River Back to Life. The project’s aim is to enhance the urban corridor of Beirut River and revive the green and blue infrastructure delineating it. 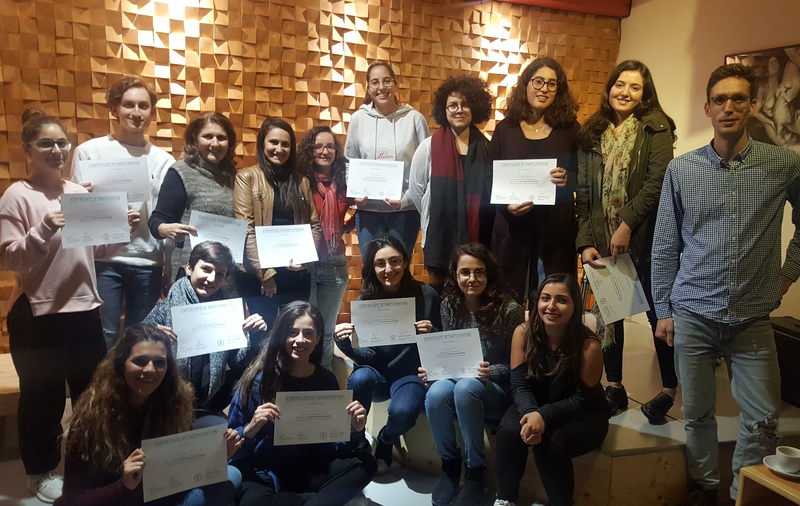 In order to achieve this goal, we defined an initial pilot project located around Bourj Hammoud and Badawi neighborhoods and looked at the site challenges specific to the Pilot Project context. We started with a study of the status and conditions of the river. We developed guidelines that set the general direction of potential interventions responding to the identified challenges. We focused on two important aspects: community and nature. We propose connecting the surrounding neighborhoods and integrating nature in the urban environment. The human-centered design proposal tackles environmental and social concerns, and engages local stakeholders in finding locally adapted solutions. It is important to mobilize the community and the local authorities to work towards a self-sufficient and sustainable network that empowers its human and natural resources. LANDFORM house is characterized by its landscape strategy. Employing a formal vocabulary culled from the study of the region’s past indigenous civilizations, the residence recreates a complete ecosystem in order to introduce, protect and improve the proliferation of local wildlife by enhancing biodiversity in a dense desert city. Green before their time, the Nabataeans perfected water collection & storage though the use of local materials in the deserts they inhabited, using the landscape as their fortress, cunningly working in and within the earth to create their camouflaged structures. LANDFORM draws its inspiration from the land-embedded monuments they left behind. Local natural materials are used to translate landscape into architecture, creating a residence that appears to be carved out of the earth and rising from the ground, blurring the line between the natural and the artificial. The strength of LANDFORM lies in its ecosystem approach. Extensive research and cross referencing of the local flora & fauna is conducted in order to choose appropriate native trees and shrubs that will attract a maximal number of birds and urban pollinators to the site. Migratory species are also studied, as Riyadh is located on an important bird migratory path. In a city where the architectural reality is deeply rooted in privacy with residences completely encircled by 3 meter high walls, FENCE house attempts to pervert the traditional mould in Riyadh, KSA. Our scheme is driven by the integration of the obligatory fence, the house + landscape into a unified system, blurring the boundaries between the three. This duality is nurtured by creating a complete biodiversity-enhancing ecosystem that connects the interior and its inhabitants to their site. FENCE house offers an alternative to the predominant sealed envelope scheme by reinterpreting the traditional courtyard house. A sustainable contemporary approach restores an open relationship with the exterior courtyard without compromising cultural standards, all the while maximizing natural light and reducing the water + energy footprint. Not Just About Dalieh is our call to action. Dalieh is a place of many layers that tie back to the network of the city: Archaeology, Fishing Port, Biodiversity, Accessible Space, Nature, Socio-cultural exchange spot. We invite you to #DiscoverDalieh with us on Intagram and Facebook. We are pursuing the most stringent environmental certification, the Living Building Challenge, which goes beyond LEED certification to introduce the idea of Regenerative Buildings, buildings that give back to the environment and enhance Biodiversity. 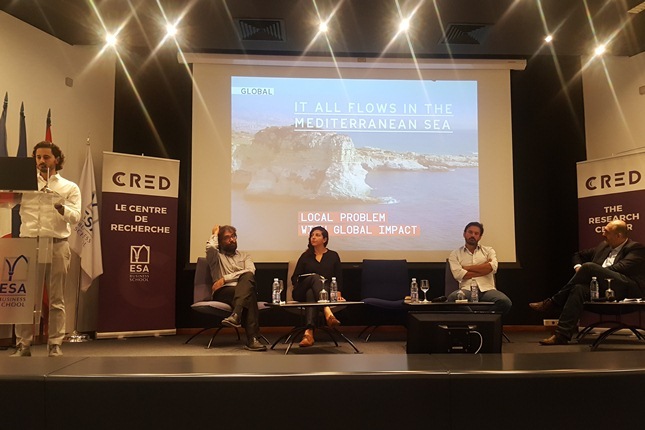 Given Lebanon's geographic location and water scarcity potential, theOtherDada (tOD) is particularly emphasizing on the Water Petal, performing detailed calculations and researches related to hydrology with Dr Nadim Farajallah and waste water treatment for re-use to target the Net Zero Water and Ecological Water Flow imperatives. Because of anticipated warnings of global warming due to increase of greenhouse gas emissions, tOD is also taking into consideration the Energy petal wherein the built environment relies on renewable forms of energy and operates in a pollution-free manner. Due to a lack of governmental incentives, the high cost of Photovoltaic Panels inhibits us from pursuing the Net Zero Energy petal, but this doesn't stop us from introducing a small PV array to meet the needs of external lighting and equipment. Another main challenge we are tackling is the Materials Petal, as we are exclusively specifying materials that have no toxicity whatsoever to the environment as well as human beings. Commonly used toxic materials such as PVC are replaced in our design by non-toxic alternatives. GARLIC house is weekend retreat is located in a village called Thoum in Batroun, North of Lebanon and is about 120 m above sea level. It consists of a private family house (area= 80 square meters) and a guest and guard's house (area= 95 square meters) located within a master plan (site= 7,000 sqm) which design and construction would be divided into two phases to allow for future expansion not exceeding 300 m2. The project footprint is minimized and considered in a way not to hinder the existing biodiversity; furthermore, our intention is to set an exemplary residential project in Lebanon in terms of sustainable architecture, use of renewable energy resources, and water efficiency; consequently, promoting a symbiotic relationship between people and aspects of the built environment. We are working with environmental consultants Eco Consulting, as well as with electromechanical engineering company OPUS specialized in sustainable solutions. IBSAR, a local association, has conducted a Biodiversity Survey on site at different times of the year, mapping the existing vegetation to assess its environmental value and help us determine which other vegetation species to introduce that have a low water consumption and would increase biodiversity on site, with no risk of undermining the existing vegetation. A beach house with a minimal footprint designed to reduce its impact on the natural site and maximize the connection of indoor/outdoor space. This was made possible by splitting the house in two and moving one half of it upwards to enhance views and free space underneath. A courtyard punctures the space and highlights the cantilevered upper floor, while the swimming pool is raised as well to avoid digging into the site, and is instead embedded in the roof of the Living area. The objective of theOtherDada (tOD), in this project, is to provide sustainable architectural solutions for the insulation of this family house, in particular from the harsh climate of Riyadh which is accentuated by the poor and unreliable infrastructure of the rapidly sprawling city. The North, South and West walls of the house give directly to the street and are therefore generally blind with minimum openings. Conversely, a fully glazed interior front allows for maximum exploitation of daylight and the garden view while an integrated system of shutters allows the house to become totally impervious to the outside. The program includes a bunker that extends on two floors and that can shelter the whole family. The ground floor comprises the public functions as well as the daughter’s quarters which are given a distinct treatment. The upper private areas are treated as two separate volumes; the result of their staggering creates a number of shaded and private terraces gathered around the swimming pool. This project is a residential compound containing five family villas, one reception villas (Majles) and mosque. The site is in Khobar which in brief has hot and humid summers, cold and dry winters. It is located on a plot facing the Persian Gulf Sea. Our design approach of the project was to move from a reclaimed land to a multi-ecosystem habitat. The site is located on a reclaimed land, with a low ecological value and deprived habitat that used to be an ecologically rich and biodiverse mangrove forest. Other than the absence of habitat, we were presented with 3 main environmental challenges: very high sun exposure on the southern and western side, prevailing winds from the north-east side, poor soil and sea water intrusion on site. The main landscape solution that we presented is the creation of 6 ecological areas where each has a precise list flora that would be planted to attract specific fauna such as birds, pollinator and insects. The ecological areas proposed are: Acacia Savannah Plains, Food Production, Oasis, Mangrove and Wetlands, Coastal Desert and Desert. Water condensation features such as Zibold and dew pond. Creation of movement: since the site is completely flat, we decided to play with topography and heights. Cooling strategies such as wind scoop, cross stack ventilation, Creation of courtyards, green walls and green roofs. The main road crossing the site was placed 3.5 meters below the ground floor level. This would reduce any visual disconnection from the cars, aid pedestrian circulation as people would be able to walk over the road on different bridges, and most importantly provide a safe environment for children to play outdoors. The mosque was placed in the area closer to the community and other residential houses to make it accessible to the public. Le Yacht Club project is an exclusive venue on the new waterfront in Beirut designed by American architect Steven Holl. Dada & Associates conceived the interior architecture and the art collection was compiled and collected by theOtherDada [tOD]. 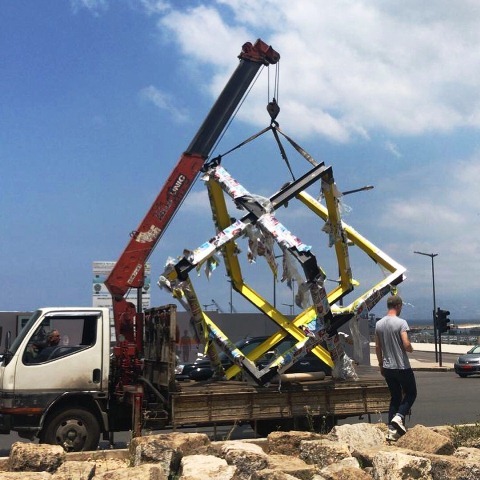 tOD saw an opportunity to intervene differently in the space and initiated a strategy to coordinate and compile a site-specific and curated art collection; a collection encompassing specially commissioned artworks by established and emerging Lebanese contemporary artists. 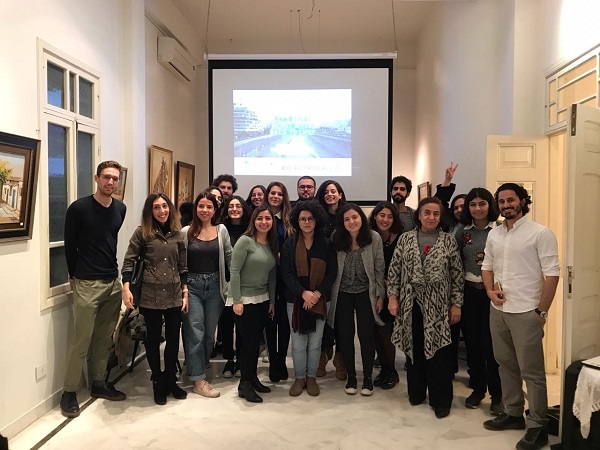 Adib Dada formed a team with curator Mayssa Fattouh and art advisor Maria Geagea Arida to work collaboratively on a collection that opened to discussions pertaining to contextual concerns. The curatorial direction of the project gave free reign to the artists to work, thus insisting that there will be no constraints on the issues they wished to tackle. The artists’ works broach a range of topics and unpack critical readings of the city and its developments. Some works also address issues of gender, violence, public space, and social issues specific to the city of Beirut. The selection process began with visits to artist studios, galleries and institutions, looking for works by different local artists, some of whom the team was already familiar with and others it discovered in the process. After months of selection, discussions, and visits the present collection was installed. The long-term vision for this project will seek to widen the scope of the collection over time through this ongoing collaboration in order to communicate and engage the ever-changing nature of the city and its concerns. The artworks were selected for their critical value and to reflect a diversity of media like installation, photography, painting, sculptural and neon works. The collection is divided into three categories: shared spaces (common areas open to members), private spaces (apartment interiors) and public spaces (outdoor and online platform accessible to a larger public). This masterplan project is at its core a collaborative project, and theOtherDada’s (tOD) role as Creative Consultant is the catalyst to its on-going development. After assessing the client brief which called for a Fashion City named Oriental Milan, tOD was able to modify the brief and set an initial strategy that called for the transformation of the masterplan into a deeply sustainable Design hub, at the core of which is a multi-disciplinary design school, supplemented with Fashion, Architecture, Art and Technology programs. tOD then introduced a competition between two architectural firms, to come up with original designs that fall within its initial strategy concept. The evaluation of the two innovative designs led to the formation of the final strategy and masterplan team comprising of PLP/Architecture, Arthesia and BDSP. Thus the N+ masterplan was born. N+ is specifically designed as an epicenter for the creative industry. The project is a creative catalyst for Ningbo - China’s largest clothing manufacture base and the origin of the country’s modern garment industry. N+ sets up a new urban genre: a curated, experiential space working simultaneously as a headquarters campus, R&D incubator, design school, cultural space and a brand-interaction venue. The organizational strategy, based on intensifying spontaneous encounters, laminates programs, character and atmosphere within an evolving urban experience. The project consists of a raw concrete exoskeleton enveloping a column-free, open-plan office space, managerial section, a courtyard and cafeteria. The design takes into consideration the harsh desert conditions and responds accordingly with thick walls and inset windows depending on their orientation and raw concrete for durability. A holistic and integrated strategic approach to different topics, tOD works as a connector and advisor on the project using its wide network and knowledge in matters related to art, sustainable living and thinking. Designs and concepts that go beyond sustainability, using an alternative integrated approach that keeps in mind the community, economy and environment. An entity that allows self-initiated projects & research to help tOD & the community always develop. This entity shows tOD’s strength in different topics, highlighting the sustainable approach. tOD is always open to collaboration, sharing and constantly encouraging positive behavior. "In fact, many in the art and design community have been taking steps toward sustainability, like architect and designer Guillaume Credoz and his project Ghouyoum, which specializes in recycled material, and the architecture lab theOtherDada, which practices sustainability in designing new habitats". "Un des principaux principes que Dada souhaite appliquer est celui des « rues bleue vertes », qui consistent dans la récupération des eaux pluviales et le filtrage eaux pluviales vs eaux usées, lequel suppose l’installation de canalisations qui couteraient moins cher qu’une usine de recyclage de l’eau. En parallèle, il préconise de planter des plantes sélectionnées, pour apurer l’eau et inspirées du platane, arbre local qui retient 50% de l’eau. A côté de ceci, des ponts piétons, des pistes cyclables sont envisagés pour résoudre les problèmes de mobilité". "In the six years we've existed, this is the first year we've actually had clients actually coming to us because of the environmental aspect. For the last five years, we've had to fight to have those sustainability aspects introduced." "The Home of Innovation Demonstration House is the first single-family home in the Middle East to earn Platinum certification under the U.S. Green Building Council (USGBC)’s LEED for Homes International Pilot program. It also is designed and built to achieve a net-zero energy balance". La collection privée d’art contemporain du Yacht Club de Beirut nous a été dévoilée lors de ce rendez-vous de l’Agenda Culturel le 21 mai. Notre visite dans cet espace exclusif du front de mer Beyrouthin a été guidée par Adib Dada, chef curateur de la collection et architecte intérieur de l’endroit, et Maria Geagea, consultante artistique du projet. Durant la phase de construction le Yacht Club connut également les fréquentes virées des artistes. Ceci résulta en un dialogue et un syncrétisme entre l’architecture du lieu, ses perspectives et enfilades et le placement in situ de la collection. La philosophie partie intégrante des trois collaborateurs, et leur modus operandi est la critique des pratiques institutionnalisées. Par leur travail, ils interrogent la manière avec laquelle les œuvres et leurs modes de représentation sont affectés et influencés par les récits réductionnistes et politisés. Ils épluchent et creusent les documents historiques dans le but de repositionner les œuvres dans le cadre plus dynamique de la production artistique contemporaine. “I’m an architect who can’t draw very well,” Adib Dada confesses. “I prefer to use my hands to build physical models.” Dada funnelled his individualistic design process into his own architecture lab, theOtherDada, which prioritises sustainability – no mean feat, when it’s a practice that is very much in its nascent stages in Lebanon. While far more developed in Europe and America, sustainability is still something that Dada feels is a marketing tool or hip trend, functioning only at a very superficial level. “We focus on enhancing biodiversity and always put the user – humans, fauna and flora – first. We look into how their well-being can be positively affected by our project.” Along with a crack team of architects, artists, scientists, economists and botanists, Dada seeks to create ‘living buildings’, whether family homes in Riyadh or office spaces in Beirut, taking into account the most sustainable ways of working with energy, building materials, and water. “We aim to connect to the natural ecosystems of sites to understand and consequently devise new potential living habitats,” he says. The Dadas - Nabil and his son Adib - have come up with a family business model that’s far from traditional. Practicing interior design and architecture out of the same office, professions as separate as they are entwined, Dada & Associates and theOtherDada operate in a way that is interdependent but independent. theOtherDada: A visit with the standout architecture lab. This guide tries hard to offer an original take on Beirut. Digging deep into its cultural and historical wealth, offering all sorts of thematic trails. theOtherDada architecture firm founder ditches “greenwashing” for deep sustainability. The awards celebrate excellence in unbuilt or incomplete projects spanning across twelve categories. The awards take place at MIPIM, the international property market, which attracts over 20,000 delegates to Cannes. We are happy to let you know that our project LANDFORM house is completed! in the Resilience category, we were happy to serve as jurors for this year’s candidates. an initiative by The Aspen Institute! our local environment, led us to being chosen. the organizers invited us to exhibit our work at their booth in Turkey Design Week! The Barlett by University College London. with a multidisciplinary team working on “Landversation” for Shanghai Project. The term biodiversity [from Biological Diversity] refer to all living organisms from all sources meaning all plants and animal species (flora and fauna) with all their genetic variability, forming communities and interacting with each other and with their physical environment with all its abiotic components like water, air and soil and their associated ecological relationships. An innate and genetically determined affinity of human beings with the natural world. A complex community characterized by distinctive plant and animal species maintained under the climatic conditions of their region. The term biomimicry (from bios, meaning life, and mimesis, meaning to imitate) is a design discipline that seeks sustainable solutions by emulating nature’s time-tested patterns and strategies, for example, a solar cell inspired by a leaf. The goal is to create products, processes, and policies—new ways of living—that are well-adapted to life on earth over the long haul. Building Research Establishment Environmental Assessment Methodology is a method of assessing, rating, and certifying the sustainability of buildings. Protection (of something of environmental or cultural importance) from harm or destruction. A community of living organisms (plants, animals and microbes) in conjunction with the nonliving components of their environment (things like air, water and mineral soil), interacting as a system. The benefits provided by ecosystems that contribute to making human life both possible and worth living. the resources that are taken from the planet including the resources consumed by the producer and the pollution released while making that product. what we give to the planet when we directly create change for the better. For example planting a tree and growing a garden are generative actions that bring Net Good into the world. All the animal life in a particular region or period. All the plant life in a particular region or period. Using vegetation, soils, and natural processes to manage water and create healthier urban environments. When marketing is deceptively used to promote the perception that an organization's products, aims or policies are environmentally friendly. Wastewater generated from wash hand basins, showers and baths that can be reused with minimal treatment. The stages a product or design goes through before, during and after a project. Wall or roof covered with plants. An international sustainable building certification program created in 2006. It is a philosophy, advocacy tool and certification program that promotes the most advanced measurement of sustainability in the built environment. Any contiguous living system, such as a vertebrate, insect, plant or bacterium. A person with an interest or concern in a specific intervention. Development that meets the needs of the present without compromising the ability of future generations to meet their own needs. It takes into account three main pillars: Environment, Economy and Equity. Sabbagh Bldg, 5th Flr, 47 Patriarch Howayeck St.